Looks nothing like Red Fanny! RED is suave and debonair. Bubbles looks like an extra from The Music Man. Of course, not that you would ever have done it. I used to have a satin pillow case too. I had to get rid of it as I couldn't keep my head on it. I will confess to sleeping in rollers in my lifetime too. Didn't make for a good nights sleep either. It was wonderful when the came out with the pink foam jobs. Really? To keep it from getting smashed while the sleep? is he a chip or an orangeotane??(SP?? )_yeah, i butchered it.....can't they rip your face off?? When I was little I cut my hair off as short as it would go. Then my Daddy slammed on the brakes and I went flying into my glass baby bottle so broke off all my front teeth. I was not so cute. Then I cut off my kittens whiskers cause she was a girl kitty. Got a spankin, so ran away from home. Still have the scissors from myself or right now RM would have no eyebrows. The price of beauty!!! It has always been painful to be beautiful. That's why I quit and go Au Naturel. Fanny, where have you been? This has been going on for a week. First Raymond Burr, now Nicaragua. You have been watching too many car chases. the texas car chase?? i watched it at work, it was the most fun i had all day. A1. It sounds like you were a handful all your life. 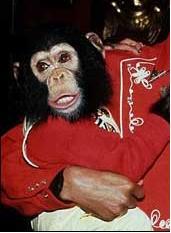 Bubbles is a Common Chimpanzee, known for his association with Michael Jackson. Jackson rescued the three-year-old chimp from a cancer research clinic in Texas in 1985. Despite the pair enjoying a close relationship, many media sources mocked the friendship. The public thought of Jackson as a bizarre eccentric, obsessed with recapturing his childhood, and he was subsequently dubbed "Wacko Jacko". Bubbles sat in for the recording sessions of the Bad album and escorted Jackson for the filming of the "Bad" music video. During the Bad World Tour, he and the singer shared a two-bedroom hotel suite in Tokyo. Bubbles initially resided at the Jackson family's Encino home, but moved to Neverland Ranch in 1988, where he slept in a crib at the corner of Jackson's bedroom. Bubbles was allowed to use Jackson's private toilet, although the chimp sometimes wore a diaper. In a 2003 documentary, Living with Michael Jackson, the singer revealed to journalist Martin Bashir that Bubbles had become overly aggressive, and had been moved to an animal sanctuary. In June 2009, Jackson died at the age of 50, after suffering a cardiac arrest. Animal trainer Dunn, speaking to the News of the World, stated that the 26 year old chimp would miss the singer. "Bubbles definitely missed him when they parted and will miss him now. Chimpanzees are intelligent. They remember people and stuff. Bubbles and Michael were close friends and playmates. The last time Michael visited, Bubbles definitely recognised and remembered him." He revealed that Jackson thought of Bubbles as his first child. Dunn added that he hoped Jackson's children would keep in touch with their "stepbrother", following their father's death. Bubbles will not go to Michael Jackson's funeral and instead will stay at home. Bubbles currently resides at the Center for Great Apes in Wauchula, Florida. I knew it was going on in Nicaragua, but now they are burning stuff and there's a big crowd. Per CNN. I think the exiled President is going to land there. I am only watching CNN because I can't stand to watch Chris Wallace. You should have been on the thread here with all of us. We luv Shep!! Poor A1 and poor little kitty with no whiskers. Page created in 5.774 seconds with 19 queries.